Tuesdays Together - Fredericksburg — Twila & Co.
What a great little evening it was last night! The Fredericksburg Tuesdays Together was held last night at the studio of Hope Taylor Photography and it was awesome! There were so many amazing creatives there and it was nice to 'talk shop' and learn what others did for their business. If you don't know, Tuesdays Together is a Community over Competition Inivitative from the Rising Tide Society. 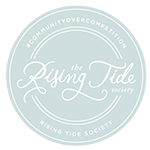 The Rising Tide Society's motto is Educating and Empowering Creatives to Thrive in the spirit of Community over Competition. So pretty much it's the best way to get together with others in the creative industry, meet and chat about the things that we deal with and our experiences. Sometimes working in this industry can be really lonely because a lot of times we are working by ourselves, and don't really have many people to talk to who truly understand. Now that we have this group, we have 50+ new friends who totally understand what it takes to run a small business and it's really nice to talk about the good and bad of the industry; to talk about what our client experience is, what mistakes we've made, and learn how to move forward. If you are a creative, I encourage you to look into the Riding Tide Society and find a Tuesdays Together meet-up in your area. I know it can be a little nerve-racking (if I'm being totally honest, group meetings and large gatherings make me really anxious and are sometimes really hard for me), but all of these people are just as nervous! Seriously, don't be scared. A huge thank you to Hope Taylor for hosting us at her gorgeous new studio space in downtown Fredericksburg (it's seriously beautiful), and for taking these fabulous photos of our group and of the paper goods I donated for the meeting! I loved putting together these custom water bottles with the Tuesdays Together graphics. I love the vintage, nautical, weathered look of the Rising Tide Society so it was really fun to play with and provide these fun goodies. Come to our August meeting! It's August 11th at 8pm, location TBD! Hope to see you there!